Departing CoinJock at 7AM should give us plenty of time to arrive into Norfolk by late afternoon. This final section of the Inside Passage is marked with 3 fixed 65′ bridges, numerous drawbridges, and a lock. We exited from the stump laden land cut, and entered our widest body of water for the day – Cutterick Sound. Winds are from the north east at 20+ knots. Which means that this shallow Sound has livened up to a bit of a chop. It also means we can unfurl the jib and gain some time. There is lots of spray going over Cat Maudy’s bow, and the ride is a bumpy. Soxy retreats to the salon. We motor sailed at 8.5 knots, and continued to motor sail up the North Landing River. The North Landing River eventually narrows into another land cut – and we are back to motors only. Here we meet our first 65′ Cruisers Challenge Bridge…and despite my most optimistic efforts to find signs of low water…this turned out to be our toughest bridge clearance of the trip. The bridge measurement marker reads 64.5’….and this clearly was wrong. I would guess less than 64 feet. We cleared, and dragged our VHF flexible antenna at the top of the mast at a 90 degree angle the entire distance of the bridge. The strong winds from the northeast are pushing water up into the land cuts. We have one more fixed bridge to clear while in the “wind tide” region of the Inner Passage. I’m trying not to think about this bridge being any lower than the one we just cleared. There is no measuring aid on the last fixed bridge affected by wind tides. We carefully watch the clearance of the sailboat directly in front of us – to give us a guage. On the prior bridge, like us, they barely cleared. On this bridge – it looks like they had more clearance. We creep up slowly….and good fortune is with us. Barely a tick with the VHF antenna – and we easily clear this final hurdle. Final hurdle before the lock that is. We still have 1 remaining fixed bridge when we exit the lock. 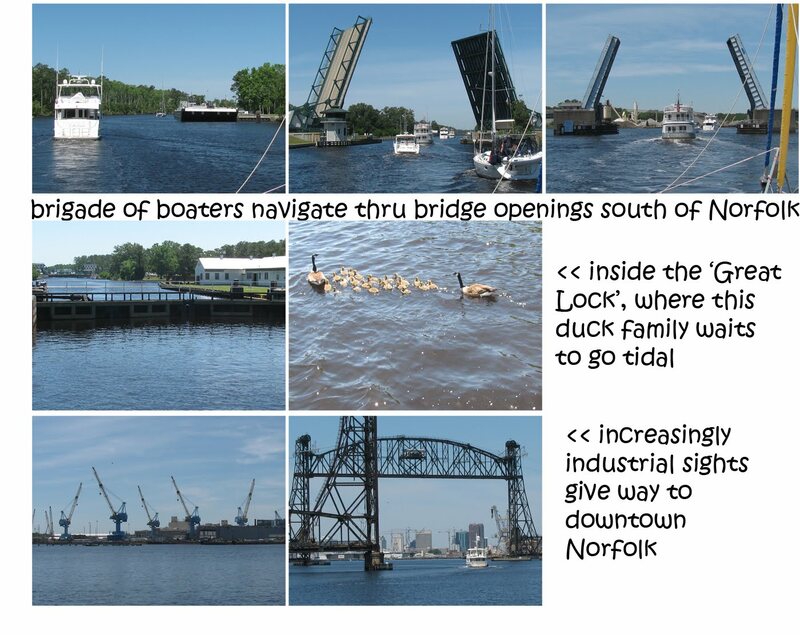 As we get closer to Norfolk, we are met with a series of timed opening drawbridges. Cat Maudy is in a brigade of 5 motor yachts and 2 sailboats. Here is how it works. The motor yachts race to be first in line for the first bridge opening. No problem. Once the bridge opens….you have to make the next bridge either on the hour or half hour. Sometimes this is too speedy for sailboats. So the motor yachts race ahead. It looks like the bridge will open for the motor yachts, and the sailboats will need to wait for the next opening. But wait. The bridge tender sees that it has 5 motor yachts ready to go thru their bridge – and also sees that if he waits 4-5 more minutes, the slow-poke sailboats will catch up. (this only happens in Virginia on the Inside Passage….in Southern Florida the bridge tenders never wait for anyone) He’s not into doing any more work than required. It’s Friday after all. And someone is thinking “miller time”. So, he doesn’t open the bridge until everyone in the brigade catches up. As you can imagine, the VHF Channel 13 (bridge tender channel) is a buzz with motor yachts who don’t want to wait for their slowpoke sailboat friends. Don’t mess with the bridge tender. He’s in charge. And he waits for the sailboats. What a lovely man! After 3 times of realizing that there is no need to rush to the next bridge – cuz the Bridge Tender Dudes are part of a network (and it’s Friday) – the speedy motor yachts finally “get it”. For the remaining opening bridges, they realize there is no need to rush. They will just have to wait for the slowest member of the pack anyway (the sailboats). We now travel in one long caravan – sailboats and motor yachts together – all at the same speeds. I sense Cat Maudy has a sly grin on her face, watching the motor yachts maintain her pace. With such a large caravan of boaters all together, and Cat Maudy at the back of the pack – the “Great Lock” for a moment looks like there won’t be enough room for us. A small fishing boat ahead of us moves to the final “large boat” spot – which would eliminate us from being able to enter the lock. My New York “Yankee” instincts take over. I race to the bow and yell – “go to the other side – we don’t have any room” at the fisherman. Normally, fishermen are drunk and would give me the middle finger – at such a request. But, we are in southern Virginia – and people still refer to you as “ma-am”. Much to my surprise – the fisherman acknowledged, smiled at me, and went to the other side of the lock giving us plenty of room to join the brigade. Mind you, this would never happen in Maryland….or Florida….or most anywhere else. The poor fisherman then struggled to re-adjust his fenders, and lines for the other side of the boat — barely missing a collision with another boater. He was single handed. My yankee bad. The final fixed bridge was a cakewalk. Back in tidal currents now, it appears we are a low tide. Wonderful. We arrive at the Waterside Marina in downtown Norfolk – where the young dockhands want us to navigate Cat Maudy into an impossible position. Strangely, Paddy hands over the VHF to me – and wants me to work it out. I think this means, to turn my “yankee” back on. I tell them “NO way” can we navigate into a dock slip – and repeat that our beam is 28′. The lovely young dockhand tries to suggest another slip. I tell him “NO” again – and tell him where we can land Cat Maudy. He gives in – and we tie up onto the facedock. I tip the dockhands real good. Being a yankee is so conflicting. We are in Norfolk. Yippie-I-eh!